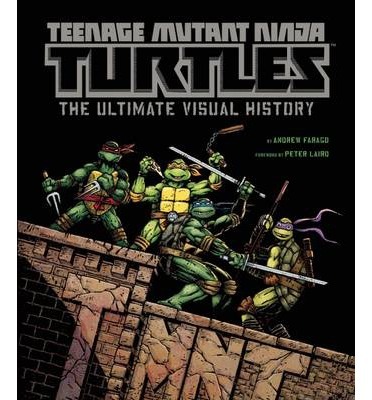 As part of the build up for the (somewhat controversial, ahem ahem…) >Teenage Mutant Ninja Turtles movie coming this summer, comic book non-fiction author Andrew Farago brings us Teenage Mutant Ninja Turtles: The Ultimate Visual History (in hardcover from Insight Editions). As you can see from the cover, it does indeed cover several different iterations of our favorite heroes in a half-shell. “Discover the complete story of the Teenage Mutant Ninja Turtles for the first time–from their humble beginnings in black-and-white comics created in a home studio in Dover, New Hampshire, to their multimillion-dollar breakout success, and their position as four of the best-loved characters of all time. Featuring interviews with every key figure in the Turtles’ evolution, Teenage Mutant Ninja Turtles: The Ultimate Visual History presents the tale straight from the mouths of those who were there, including co-creators Kevin Eastman and Peter Laird, animation legend Fred Wolf, creature effects maestro Brian Henson, and even the man behind the Ninja Rap, Vanilla Ice.” Ooo, now there’s a plus… O_o Anyway, check it out at Amazon.